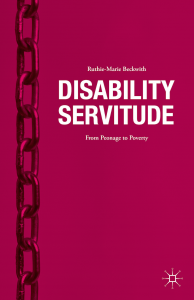 On Thursday, March 10th, 2016, from 6 p.m. to 8 p.m., Ruthie-Marie Beckwith will present and respond to questions about her new book, Disability Servitude. Drawing from both her research and her professional experience, Professor Beckwith will discuss the history of unpaid work in public and private institutions by people with disabilities and the resulting lawsuits that have pushed for wages and systemic change. Her work lends historical context to the emotionally charged issues around the ongoing segregation and low wage earning of workers with disabilities. Ruthie-Marie Beckwith is an Adjunct Associate Professor in the Disability Studies program at the CUNY School of Professional Studies. She has been writing since she was in the sixth grade, not so long ago if her memory serves her right. Disability Servitude is her first non-fiction book. Her novel, Seven Days at Oak Valley, is a story close to her heart about the people who continue to inspire her with their courage, faith, and resiliency. She makes her home in Tennessee.